Nigerian Moi Moi is a very delicous meal, so delicious that even those who do not like beans enjoy eating Moi Moi. But the No. 1 reason why lots of people do not like preparing Moi Moi in their homes is because the cooking process is long and laborious. All that peeling of beans, blending, chopping! Nobody has got time for that. Chickpea Moi Moi to the rescue! It looks like beans Moi Moi, it feels like beans Moi Moi in the mouth and believe me it smells and tastes better than beans Moi Moi! 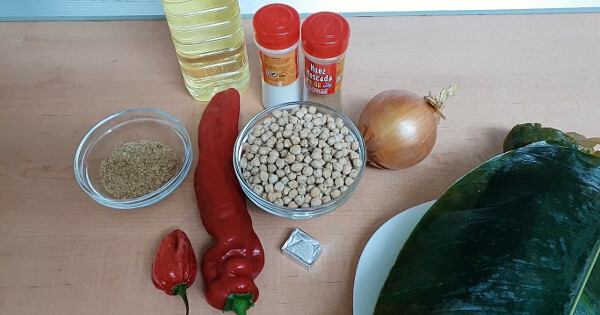 Above all, it is easier to prepare than beans Moi Moi! Yes, we can prepare Moi Moi with brown beans without peeling the beans but that's a whole story for another day because I have my reservations about that one. Use dry chickpeas. Do NOT use canned chickpeas because they are already cooked. You can use chickpea flour to prepare Chickpea Moi Moi if that's all you have. I have a recipe where I used beans flour to prepare Nigerian Moi Moi, the directions on that recipe will work with chickpea flour. Click here. Sweet peppers (fresh paprika) add a nice peachy colour to Chickpea Moi Moi. In Nigeria, use tatashe. Remember that tatashe is spicy so if you do not like spicy food, after adding tatashe, there may not be any need to add habanero pepper. Aluminium foil bags. Click here. Uma leaves (Etere): used in the video below. You can bake it in the oven, click here. You can use aluminium bowls. Rinse and soak the chickpeas in cool or lukewarm water for at least 3 hours or till you can cut the seed with your finger nails. You will also be able to peel it by rubbing it between your thumb and index finger. I soaked the one used in the video below for 6 hours. Pour the chickpea in a sieve to drain, after that pour in a bowl. Rinse, deseed and chop the sweet peppers to help your blender. Chop the onions and habanero pepper. Add the chopped sweet peppers, onions, habanero pepper, ground crayfish and seasoning cube (crushed) into the bowl of soaked chickpeas. Blend in batches with warm water till you get a smooth puree. For the quantity of water to use: when blending each batch, add water to just under the level of chickpeas in the blender. That quantity of water is usually the right quantity of water for mixing the Chickpea Moi Moi. Pour into a bowl. Add the oil and salt to taste. Mix very well and scoop into containers of your choice and cook in a steam pot. Watch the video below to see how I set up the pot of boiling water and a base to keep the wraps of Moi Moi away from the water while it cooked. For the quantity prepared in this recipe, I cooked it for 1 hour. For larger quantities, you will require a bit more time. If the water in the post dries up as you cook, add more water. When done, bring out the wraps of Moi Moi and spread on a tray to cool down to a comfortable temperature. 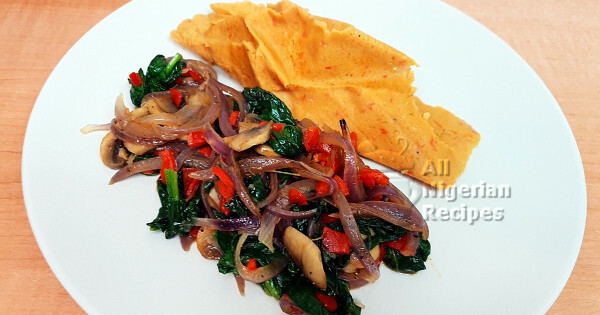 Serve while still hot but not scalding with Jollof Rice, Peppered Fish, Fried Plantains, Vegetable Garnish etc. Chickpea Moi Moi stores well in the freezer. When I want to eat from the frozen ones, all I do is bring out the wraps we need and leave on the kitchen counter to defrost on their own, then I warm them up using the same steaming technique used in cooking it. See video below.